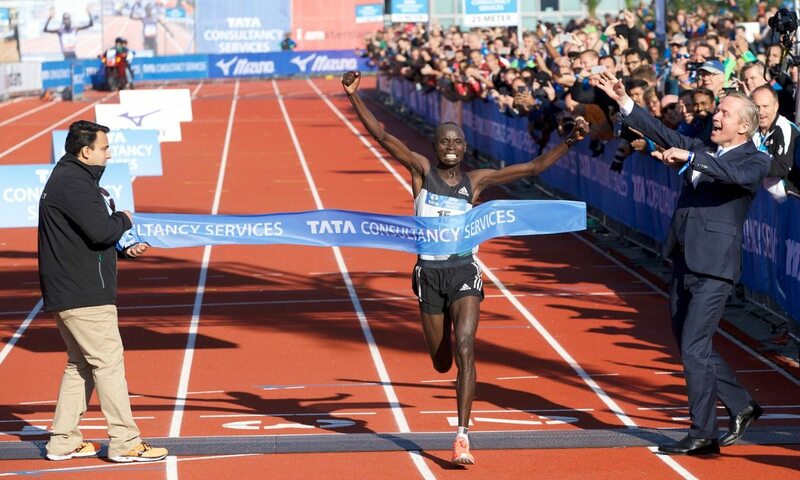 Daniel Wanjiru broke the TCS Amsterdam Marathon course record to lead a Kenyan clean sweep on Sunday (October 16), while Ethiopia’s Meselech Melkamu claimed a clear victory in the women’s race. A total of 10 athletes went sub-2:08, while eight dipped under 2:07, led by Wanjiru’s 2:05:21. That time takes almost three minutes off his previous PB of 2:08:18 set at the Frankfurt Marathon in 2014 and improved Wilson Chebet’s course record of 2:05:36 set in 2011. The runner-up spot was claimed by Sammy Kitwara in 2:05:45, while Marius Kimutai was third in 2:05:47. Three-time winner Chebet was also in action but after forming part of the large lead pack past 30km, he eventually finished 12th in 2:08:19. In sunny and still conditions, the race began at the city’s Olympic Stadium, with Wanjiru, Kitwara and Kimutai all running within a front group of around 18 athletes which passed 10km in 29:48. As the pack went through half way in 63:18 a couple of athletes were dropped, while Kitwara and his fellow Kenyan Geoffrey Kirui were to the fore. Kitwara was among those pushing the pace at 30km as the leaders went through in 1:29:47 and it looked as though Chebet was being dropped but he worked his way back up to form part of the lead group before Kitwara, Kirui and Ethiopian 22-year-old Mule Wasihun surged ahead, with Wanjiru just behind them. With Wasihun dropped and Wanjiru and Kitwara moving away, the eventual winner kicked hard before going through 40km with 1:58:55 on the clock to dip under course record pace and continue on for the win as he ran splits of 63:18 and 62:03. Laban Korir was fourth in 2:05:54, while defending champion and two-time winner Bernard Kipyego was eighth in 2:06:45 as Kenyan athletes filled the top eight spots. Just behind them was Wasihun in ninth. On his winning time, Wanjiru said: “I was expecting it. My training had been going very well. I was expecting to come and run my fastest race here. “I had a plan but in the race you can expect anything to happen,” added the 24-year-old, who has twice won the Prague Half Marathon and finished seventh in the Frankfurt Marathon two years ago. “The weather was very nice for running. Khalid Choukoud won the Dutch title in 2:11:24. The women’s race had seen Melkamu and her fellow Ethiopians Abebech Afework and course record-holder Meseret Hailu form part of the lead group together with Kenya’s 2013 London Marathon winner Priscah Jeptoo. As Melkamu, who won the Hamburg Marathon this year and is also the sixth quickest 10,000m runner in history with her 29:53.80, forged ahead, no one could stick with her and she eventually crossed the line in 2:23:21 to beat Afework with 2:24:27 and Bahrain’s Eunice Chumba with 2:25:00. Jeptoo, who after suffering injury had said before the race that she had been training pain free and was aiming for a time under 2:23:00, finished fourth in 2:25:57, one place ahead of Hailu with 2:27:50. Clocking 2:33:42, Ruth van der Meijden claimed the Dutch title.